I got to do a bit of Figaro sailing today. 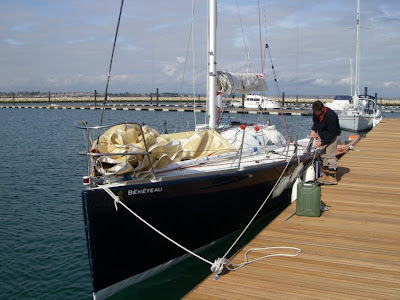 Nigel King is based out of the new Dean & Reddyhoff marina in Portland, and I joined him for a quick shake down sail before he sets off for the Solo Les Sables from Les Sables d’Olonne, France. I'd met Nigel years ago on the J145 Jazz, where I did a number of the RORC races with them, and the Middle Sea Race. I bumped into him again recently at an RYA coaching meeting, and offered any help while he was Weymouth based. Hopefully I'll be able to help out a bit more when he's back in town. 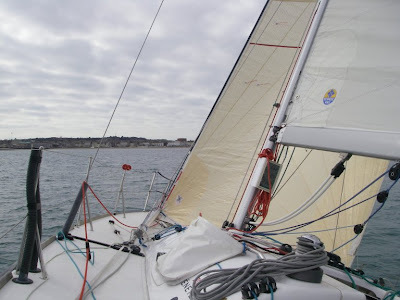 Its been a while since I sailed anything much bigger than the Moth, so it was good fun to sail a new boat, and learn about the demands of solo sailing.